Not even tax stress or website domain woes can stop the healing powers of Nathan Macintosh’s comedy, kids. Believe it because I lived it! This Friday, March 29th, the second comedy album for Nathan Macintosh drops (via Comedy Records). TO THE POINT was recorded at New York Comedy Club’s East Village location in front of a gracious and lively audience. 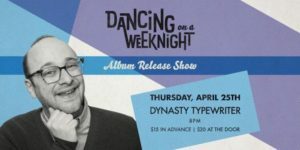 The album, produced by Scott Lindner from Pinch Recording, is a tight twenty-one minute set that was inspired by American rapper Pusha T’s seven-track album, Daytona. Your high-spirited comedian says everything you’re thinking in this fast-paced comedy adrenaline patch, including taking on topics like America’s promise to move to Canada, the dark side of visiting Disney World, the cops and coffee conundrum, the perils of not siding with Beatles music, and the REAL losers of the Oscar awards. Today we have a juicy track from the album for you titled “Check Phone Too Much: Self Checkout” in which Macintosh jokes about the world’s phone obsession. I agree with Nathan, I don’t think anyone will use their phone to talk to with another human being ever again. Enjoy! Mentions: To The Point is available wherever comedy albums are sold. Follow Nathan on Twitter & Instagram. Check out his podcast Positive Anger HERE. He headlines Gotham Comedy Club in NY 3.29 & 30th. gothamcomedyclub.com for TIX.